Pork shoulder, vegetables and chicken stock. Just a few simple ingredients. I say a lot of things are simple, and sometimes this is a bit of an understatement. In this case it’s spot on. 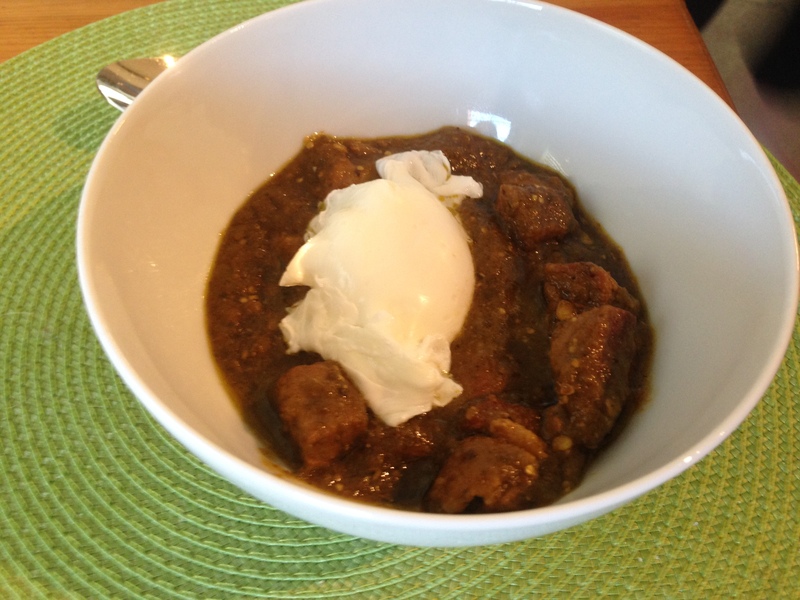 The stew itself is nothing more than pork braised in chile salsa, so nothing to it. The magic happens when heat, acid and protein come together in one of the greatest comfort foods of all time. Begin by making a utilitarian green salsa. 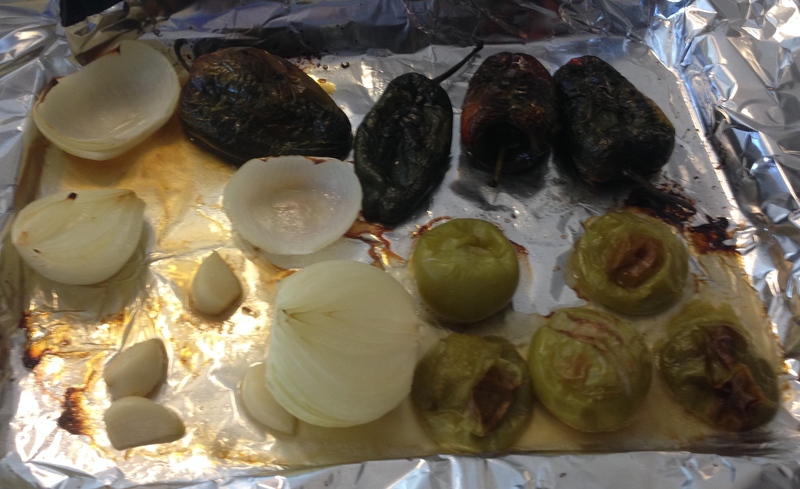 Rub peppers, tomatillos, and onion with oil. Set on a foil lined baking sheet, put in a 450 oven and roast for 40 minutes. After 20 minutes turn the vegetables and, at the same time, add the oiled garlic to the sheet. The garlic gets less time to roast because it will otherwise burn, and burned garlic is far from pleasant. When the roasting’s finished remove the chili stems*, place all of the vegetables in a blender or cuisinart and puree. Finish with salt and pepper to taste. Just pull the stems off the peppers, roll the foil corners into an envelope, and drop the vegetables and roasting liquids into the food processor. 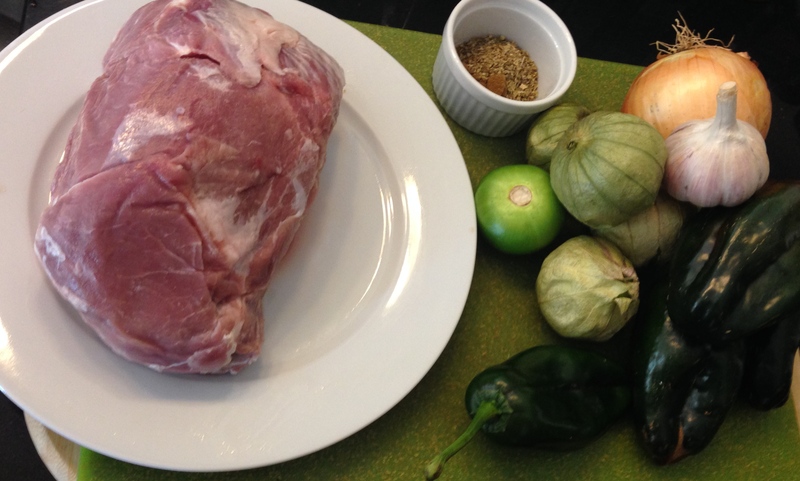 Once the vegetables are under the heat, it’s time to start the pork. 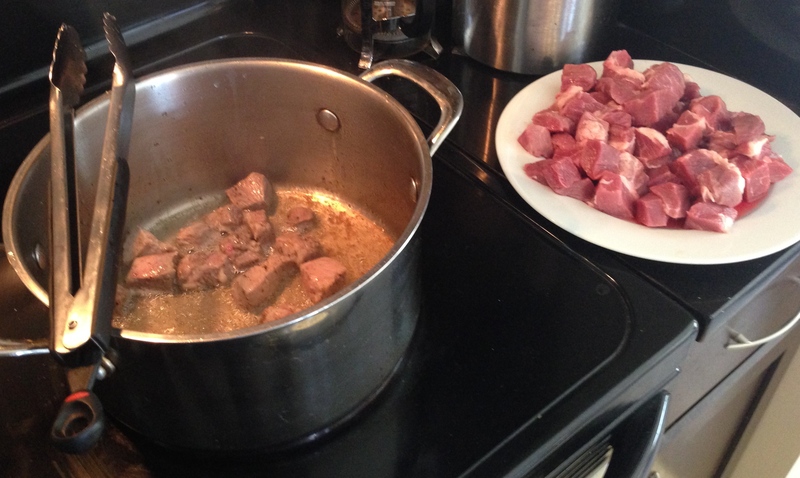 Season the cubes with salt and pepper, add oil to a cooking pot over a high heat, and sear the pork. Once the searing’s done, deglaze the pot with half a cup of chicken stock. … so that the meat has nice, crisp edges. Put the pork, puréed vegetables, chicken stock, cumin and oregano into the stew pot. Add a little more salt or pepper if needed. Bring to boil, reduce to a very low simmer, and cook uncovered for about two hours. Stir every 15 minutes or so. 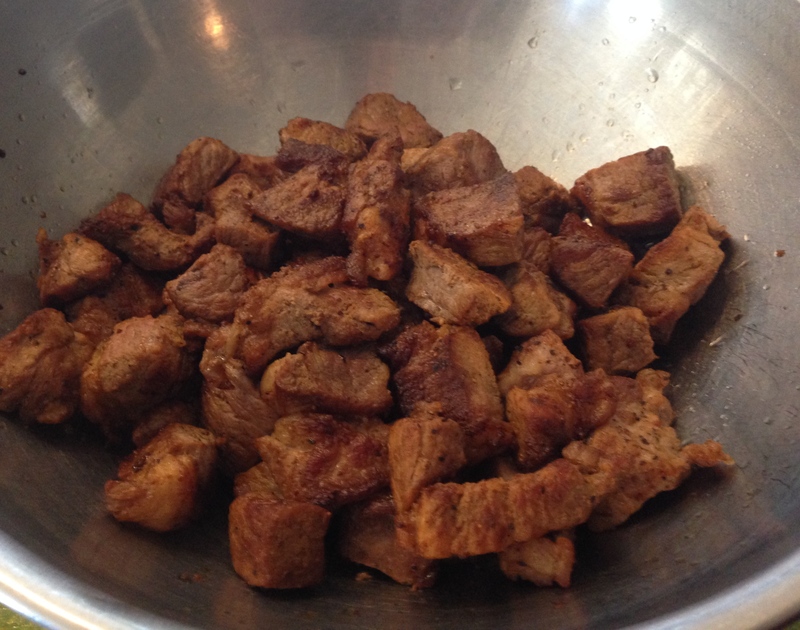 The idea is to let the acids from the salsa tenderize the pork, so you should add water if the liquid becomes too thick. 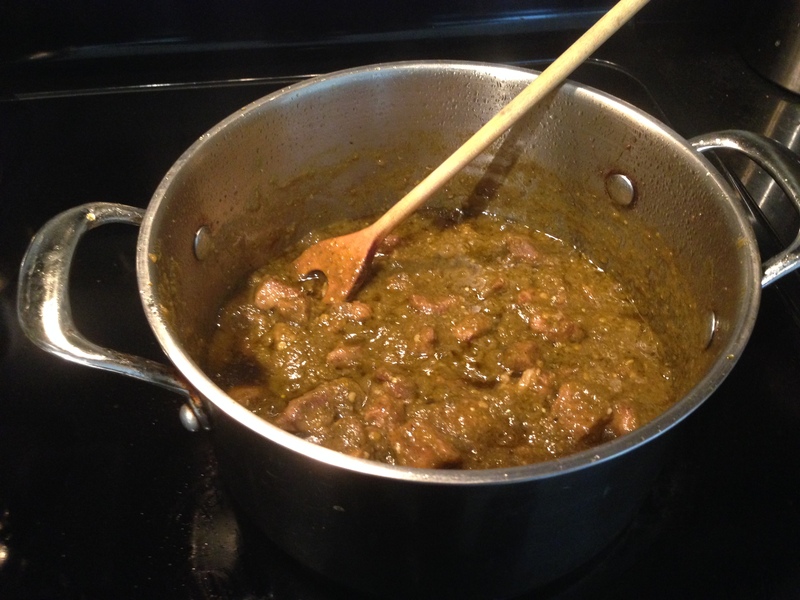 An alternative method is to prepare the ingredients in a dutch oven and finish cooking by braising in the oven. Try serving with a poached egg. The custardy yolk will mellow its bite and enhance the porky goodness. What could be easier? For an extra bit of mellow, you can serve with a poached egg on top. Enjoy! * Quick reminder on the roasted chile. The seeds are the hottest part. Take them out if you don’t like the heat.